Q’eqchi’ Communities: June 30 Se’Chaj, Maya Q’eqchi’ Farmers’ Association, Se’Tal, Agua Caliente Lote 9, Community of April 13, Lote 8, Las Nubes, La Ceiba, El Zapatillo, and all communities of El Estor, Izabal. To the national and international public, we present the following facts. We denounce that the Maya Q’eqchi’ people in El Estor have been fighting without rest, from 1960 until today, to defend our right to land and a place to live with dignity, work, and feed our family, as well as a place to strengthen our culture and identity. On Thursday, July 10, 2014, the National Civil Police (PNC), security guards of the Guatemalan Nickel Company (CGN), and other group leaders contracted by this company, took actions against the community of June 30th Se’Chaj, committing a series of illegal acts. Judge Sandra Janeth Méndez Nájera authorized the eviction but the communities were never notified. Without presenting the eviction notice, the police began shooting tear gas at women and children in the community of June 30 Se’Chaj. Three youth were wounded and numerous houses were burned as a result of this violent action. The youth cannot be named due to fear of reprisal. 15 students who were in a school building 100 meters away from the eviction were affected by the tear gas. For these reasons, we publicly denounce Judge Sandra Yaneth Méndez, who has always supported the CGN. This is the third time that she has taken actions against Q’eqchi’ communities, causing us to believe she is biased in favor of the Guatemalan Nickel Company. During the first eviction attempt in Lote 8, Lote 9, and Setal, she accompanied the private security guards from the company, and she has also protected hired assassins contracted by the company (who have been identified by the communities). 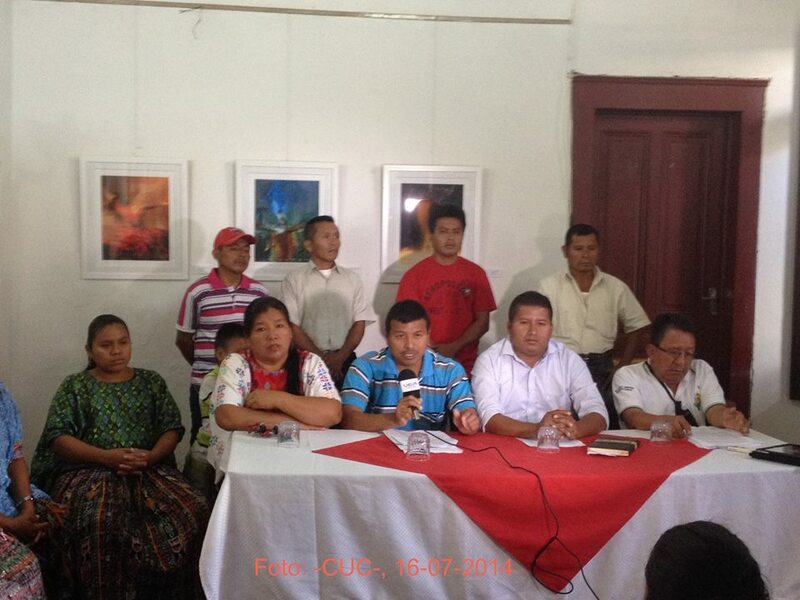 This group tried to massacre families in the community of Setal on June 30, 2012. We hold the government of Otto Perez Molina, as well as the governor of Izabal and the Guatemalan Nickel Company (CGN), responsible for the violent eviction carried out on July 10, 2014. The CGN intends to take our land away from us at whatever cost, often acting with the support of government institutions. On May 30, 2014 President Perez Molina authorized and participated in the inauguration of a new phase of mining exploitation by this company. This has been imposed against the will of affected communities. Prior consultation, as outlined in Convention 169 of the International Labour Organization, was never carried out. We ask the Attorney General to cease the evictions and to stop defending the interests of the Guatemalan Nickel Company – a company that is violating the rights of thousands of Q’eqchi’ families. We ask that agrarian institutions respond as a matter of urgency to the demands that the Q’eqchi’ communities in the municipality of El Estor, Izabal have made for the legalization of their land. We ask the Public Prosecutor’s Office (MP) to investigate the CGN’s parallel security structures that participated in the violent eviction on July 10, 2014 and the armed attack against families from the community of Setal on June 30, 2012. We ask judges to respect the processes for dialogue and negotiation that the Q’eqchi’ communities have started with this country’s agrarian institutions in order to legalize and get titles for their land. We ask judges to stop emitting eviction orders whenever they feel like it and to stop only paying attention to the information that CGN and other businessmen give them. We also ask for impartial sentencing. We ask the Public Prosecutor’s Office (MP), the Human Rights Ombudsman’s Office (PDH), the International Commission against Impunity in Guatemala (CICIG), and the United Nations High Commissioner for Human Rights to investigate the actions of Judge Sandra Yaneth Méndez. We do not believe this judicial action (the violent eviction on July 10) was carried out according to law. We ask the Human Rights Ombudsman’s Office (PDH) to provide a truthful and objective report of the violent eviction carried out on July 10, 2014 in the community of June 30 Se’Chaj and to form a permanent commission to verify the ongoing violation of our rights by CGN. We call on the population of El Estor to organize against the injustices that we live with. We should not allow CGN to continue abusing our rights. For our lives and the lives of our children, we should defend what little land and territory we have left. We believe that the solution to this problem generated by CGN is for the Guatemalan government to exercise its sovereignty and rescue its dignity by canceling the exploitation licenses granted to this company. she should be recovered and defended!